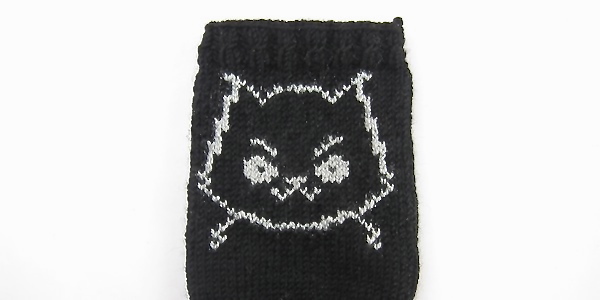 My friend Daria recently celebrated a birthday and asked me to make her some new handwarmers with a “crazy cat” on them as a gift. I think my cat came out a little more mad than crazy, but I still think they are very Dar! 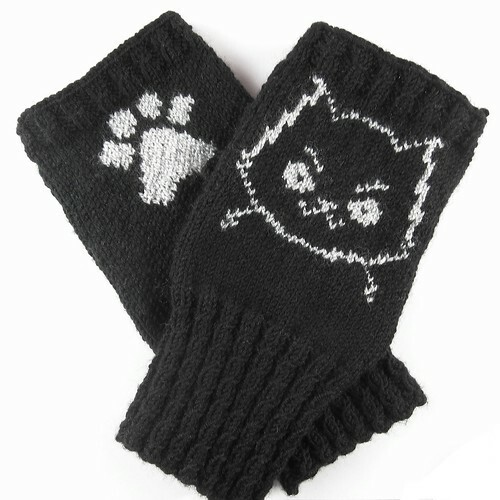 They feature a cat face on the front and a paw on the back. 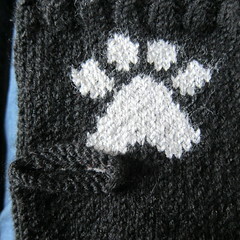 (The paws are a tribute to the paw print tattoos Daria has.) 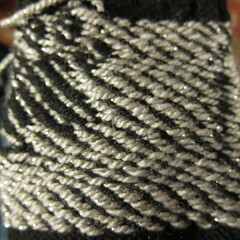 The cuff and top band are a simple cable ribbing. 1. Knit to where you want your thumbhole. 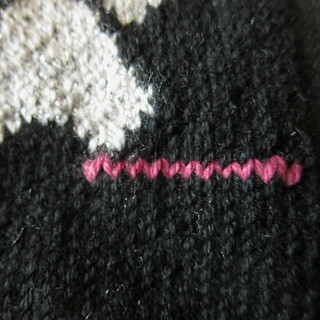 Knit the stitches for the thumb hole with a piece of scrap yarn. Using a yarn that contrasts from the working yarn is really helpful. 2. Move those thumbhole back to the left needle. Now, knit them again with your working yarn. 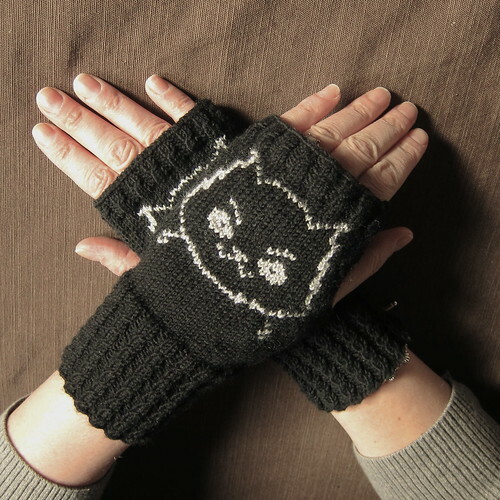 Then continue knitting the rest of the mitten or handwarmer. 3. When you have finished the mitten or handwarmer. 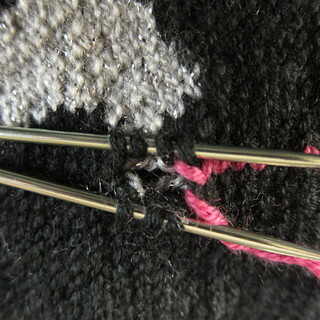 Carefully remove the scrap yarn at the thumbhole picking up the stitches from above and below the scrap yarn. You want to put the top and bottom stitches on separate needles. 4. Once you have removed all the scrap yarn, you are ready to knit your thumb. Typically, one or two stitches are picked up on either side of the thumb from the body of the mitten. 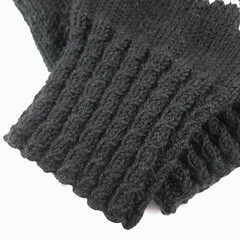 One last tip for colorworked mittens – When you are knitting with the scrap yarn do not twist your floats. Go ahead and twist them when you knit those stitches with your working yarn. These handwarmers are woman’s size 8. You can change the size by adjusting the gauge. I do the design by stranding my yarns. I twist the yarns every 3 stitches so there are no long floats. Cast on 64 stitches. Divide by putting 22 on two needles and 20 on one. Join in the round being careful not to twist. Place a stitch marker between first and last stitch to mark rows. 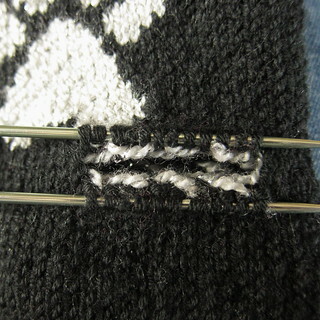 Repeat rows 3 – 6 six more times or until cuff is desired length. Row 24 (Right hand): k3, k next 11 stitched with scrap yarn, move those 11 stitches back to the left needle, k the rest of the row with working yarn. Row 24 (Left Hand): k18, k next 11 stitched with scrap yarn, move those 11 stitches back to the left needle, k the rest of the row with working yarn. Row 1: Pick up and knit one stitch from between the top and bottom stitches, knit the stitches from the bottom, pick up and knit one stitch from between the bottom and top stitches, knit the stitches from the top needle. Place stitch marker. This pattern has not been test knit. If you find any problems with it please let us know. Copyright 2013 Kathy Lewinski JustCraftyEnough.com Do not duplicate for distribution, sell or teach this pattern without permission. They’re fabulous! The cat is awesome. No, I don’t have a skull pattern, but I’m sure you can find one online easily. I’m not hiring test knitters, but the pattern is free so go for it. I cannot figure out how to “carry” the contrsatng yran (for th face, paw etc). When I knit the first row, the contrasting yarn end up on the left but for the next pattern row, I need it to be on the right! Can these be done with size 2 needles?? You need to knit them in whatever needle size gives you gauge. So if you can get the required gauge in a size 2 then use them. But if you can’t get gauge the results will be a different size. What is the weight of yarn you suggest for this pattern? I used Debbie Bliss Baby Cashmerino which is a sport weight.